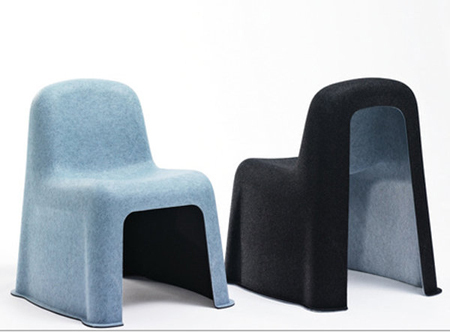 Danish design duo Komplot is the first to create an industrially produced chair made strictly from textile. The material – PET felt is a 100 % recyclable material made from used water- and soda bottles. The production process neither demands an internal frame, plastic, screws, glue or other reinforcements. What’s not to like about this it’s fabric & green; breaking free from the typical idea of fabric furniture. The production process of this product is incredible & easily be applied to limitless forms & architecture.